What is climate justice? How does it connect to racism? Why should Somerville residents care about climate change? How are young people experiencing, dealing with, and fighting climate change? How does and will it affect us, from the food we eat to the health inequities we face? What can we do about it? If you’ve ever wondered about one or more of these questions, this workshop is for YOU. 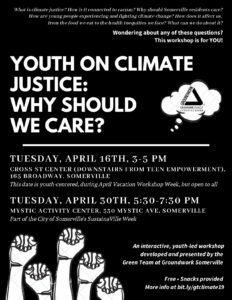 The youth leaders of Groundwork Somerville’s Green Team have created and will lead this interactive workshop for the Somerville community to learn about and discuss climate justice in our city and beyond. This workshop is YOUTH-CENTERED, but open to all. It is during school vacation week and part of the Somerville Youth Workers Network April Vacation Workshop Week. This workshop is part of the City of Somerville’s SustainaVille Week. Both workshop times are FREE and snacks will be provided.